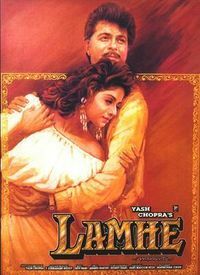 After seeing Om Shanti Om this week, I was reminded of the parody of Bollywood classics found in Lamhe (1991). I was aware of the a lot of the films parodied in OSO, but missed many. This only eggs me on to watch more and more of what Bollywood has to offer! I must add that after watching Lamhe, I considered Anil Kapoor attractive, pre-moustache era, which shocked me. Also, this movie has some AWESOME tight slaps to the face! This is my fav part of the film. Anil Kapoor has been depressed and heartbroken for a long time, but he likes b&w classic Hindi films, so Sridevi and Anupam Kher enact old classic bollywood songs in order to cheer him up. Waheeda Rehman joins the fun in this second half. Such a natural dancer, even at this age! And she performs her OWN number from one of her movies!